Chatroulette is a new video chat service that randomly assigns users video chat partners anywhere around the globe. The concept is pretty simple yet powerful. The founder is still under 18 so has yet to collect his Google AdWords earnings and he’s been offered a $1 million buy-out, and last month 30 million unique visitors hit Chatroulette, which is averaging one million new users each day. Great talk by Jesse Schell, founder of Schell Games and former creative director of the Disney Imagineering Virtual Reality Studio. A veteran game designer, he is also on the faculty of the Entertainment Technology Center at Carnegie Mellon University. Found thanks to Agathe for the link to the Gigaom article. 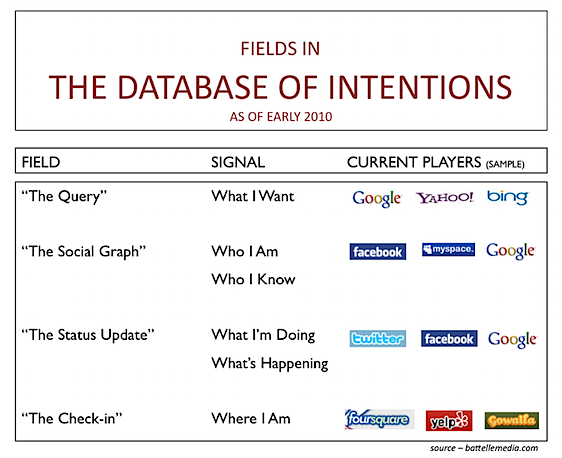 Great post by John Battelle The Database of Intentions Is Far Larger Than I Thought. Taken together (and honestly, there’s really no other way to think about it, to my mind), these signals form a Database of Intentions that is magnitudes of order larger, more complex, and more powerful than my original concept back in 2003. And while the current players in each category are clear, what’s also clear is that the battle is on to control each of these critical signals. All of this begs a new definition of Search. I’ve often said that Search should not be defined by web search, but rather, by what a search is in the abstract. To my mind, each tweet or status update is a search query of sorts, as is each check-in and even each connection in the social graph. A more catholic definition of search would allow for a reconciliation of all these fields in the Database of Intentions.